with a super air lift system,the bio-filter has excellent effect on dissolving oxygen in the water and working silently.physical filtration combining with biochemical filtration,themulti-layers sponge filter supports the breeding of dense nitrobacteria,which will break down harmful waste,and will give a clean living environment for your fish,they are suitable for view fishes and especially useful for breeding small fishes. 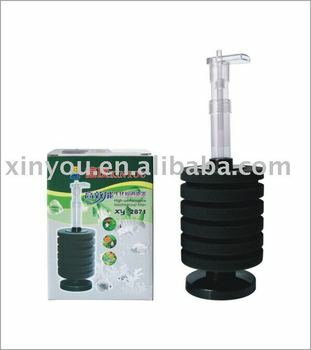 1)the tube can expand and contract freely,supply the water with needed oxygen. 2)Duck mouth shape drainage can let the water in the tank have a whole cirulation.